W. Earl Bledsoe was born in Marlin, Texas. He graduated from Levelland High and from South Plains College (Levelland, Texas) with an A.A. degree; West Texas State University with a B.A. degree in English and Spanish; the M.Div. degree from Perkins School of Theology/SMU, where he was a Benjamin E. Mays Scholar. He earned the Doctor of Ministry degree at Drew University. He was ordained deacon in 1983 by Bishop Finis A. Crutchfield, and elder in 1987 by Bishop Benjamin R. Oliphint in the Texas Conference. 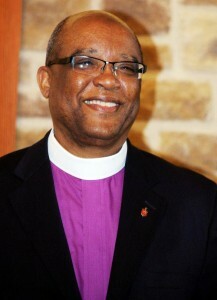 Earl Bledsoe was the first elected to the episcopacy in July 2008 at the South Central Jurisdictional Conference and assigned to the Dallas Area. He is currently assigned as episcopal leader of the New Mexico/Northwest Texas Annual Conferences, headquartered in Albuquerque, New Mexico. He serves as President of the GCORR Board of Directors and as such, is part of the Connectional Table. He also serves as Jurisdictional Episcopal member of the Standing Committee on Central Conference Matters. He serves on the boards of McMurry University (Abilene, Texas), Southwestern University (Georgetown, Texas); Texas Methodist Foundation (Austin, Texas) and the Methodist Children’s Home and as an ex-officio member of New Mexico Conference Foundation.